Bentley and Pierre eat twice a day at pretty much the same time. Actually, Bentley sets the time that best suits his belly and will hound me relentlessly until he is fed. I can adjust his dinner time a little but when the boy wants his breakfast, nobody is going to stay asleep. This is usually at 7:00a.m. They eat and we all go back to bed for a little while longer. I’ve been gradually feeding them later in the evening, so Pierre doesn’t go too long without something on his stomach. I have worked the time up from 3:30 to 5:00. The time slipped away from me yesterday and it was almost 6:00 when I went to start their Dr. Harvey’s. 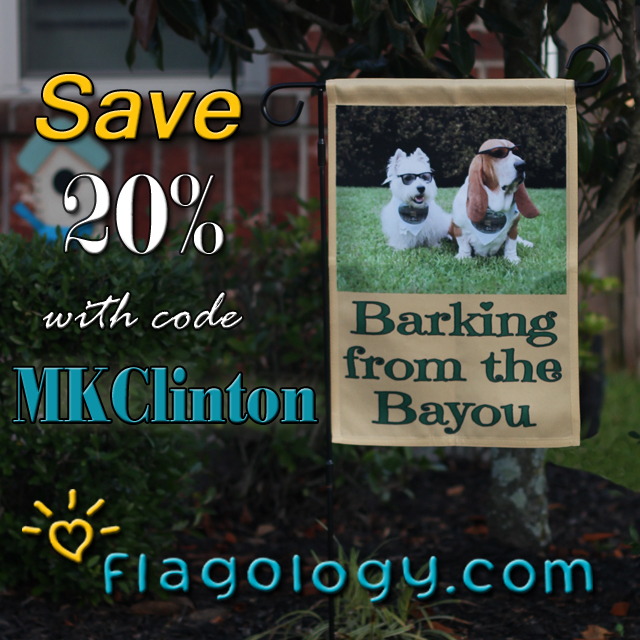 If they gave dogs Academy Awards for drama, these two would have statuettes. Instead, they had this special dedication for me. 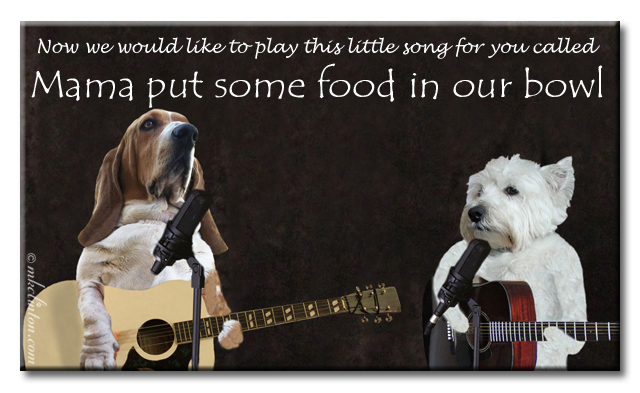 How do your pets let you know it is time to eat? 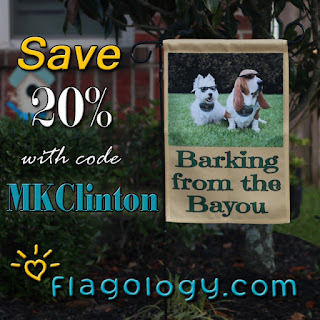 Don’t forget our Flagology garden flag AND doormat giveaway! Be sure to enter for your chance to win. You guys are too funny☺ My mom is rarely late with my meals, thank goodness! We are hounds, but not food hounds. Treats are something we demand at certain times, but for our meals, we wait patiently. Times are pretty standard for breakfast, but dinner can vary by an hour or two, sometimes even more. Mom says it's best not to eat at the same time so we don't come to expect it. Like Emma and her sisters we are more alert for snacks, but we do let Mama know if it is getting late and there isn't any food in our bowls! If you are interested in a feline musician I know Jerry Underfoot would love to join your band Bentley & Pierre. I'm not too particular about meal times. Ghostwriter used to just fill the doggie bowls up with dry kibble and we (Miss Ginger and Joey dog and I) would eat whenever we were hungry. Now I get some in the morning and some in the evening after the humans get their dinner. Mom just KNOWS that breakfast has to be served in our bowls by 6:30 the latest or we start wooing a song. For dinner, Lightning sits in front of the counter where our bowls are and just stares up there while Misty and Timber get into some crazy fit of zoomies. My peeps are convinced I have a clock hidden somewhere as I nose exactly when lunch and dinnertime are!!! Hazel lets us know by starting to bark when she thinks it is time for breakfast and both seem to know when 5 o clock rolls around for dinner. Mabel also knows when it is Monday & Wednesday evening and she gets to go to class! I usually stare at Mom to remind her that it's time for my kibbles. If she doesn't notice or she's too slow, then I vomit. THAT gets her attention! We usually start bothering the mom when we're hungry. She can't get anything done because we get right in her face until she feeds us. I just try stealin momma's food! Our dogs eat at 9am & 5pm but Icy is always trying to get us to feed them at 4. Many times I give in to the 4pm food howling! Can Hemp Infused Treatibles Help Your Pet?